Bebo & Cigala How is it that I never heard this album before? It is stunning. Gorgeous. Bebo Valdés and Diego 'El Cigala' on their first album. Normally I'm not a huge jazz fan, although I love a couple of artists. This CD is typical Cuban music, but sung with a flamenco twist. 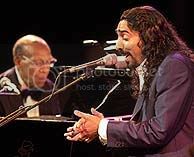 Bebo is a master pianist/composer from Cuba, and Cigala is a flamenco singer from Spain. The songs are about love and loss. I can't wait to listen again....but it's the type of album that requires you to listen. Not meant to be background music. And tissues are needed, even if you don't speak Spanish, these songs will get you. Lo interesante: Bebo is 84 years old. Won 2 Grammys last year. 'El Cigala' is a nickname, I think it means lobster from Norway. Don't quote me on that. This is yet another CD given to me by the world-traveler, long-time friend, and fellow mischief maker: SusyKat. Her generous gifts are among the most magical stuff I have; she has a tendency to draw intense and interesting people and things to her. And share them. Wondering about the other addictions? I probably shouldn't use that word, as I don't have problems with substances. I do get hooked on one CD at a time. I listen over and over and over. The same thing happens with food. Right now it's sweet potatoes. Well, I don't listen to the sweet potatoes. My husband might say that I'm addicted to handbags, shoes, and I'm on the verge of a sock problem. dearest dawn, you've got to remind me to burn you some cds once I get back home. I've got so much music in my li'l ole Ibook, and I love to share it. What's remarkable about this album is Cigala, one of the most famous flamenco singers of Spain, is the intensity he brings to these old Cuban classics. acc. to the dictionary of REAL ACADEMIA ESPANOLA, 'cigala' is a river crab, though lobster from norway sounds good too. Funny, always hated sweet potatoes as a kid, the only vegetable I couldn't tolerate. As the sweet potato is a very popular menu item in my mother's native Peru, over the years, I've tempered my aversion. I now find that good ceviche is incomplete without a slice of camote(sweet potato), its sweetness balancing out the acidity of the lemon. *big smiles* Yep, happy 2005! That would be a great way to start this year.